If I start counting varieties of 'Indian Breads', it will definitely go beyond my imagination!!! 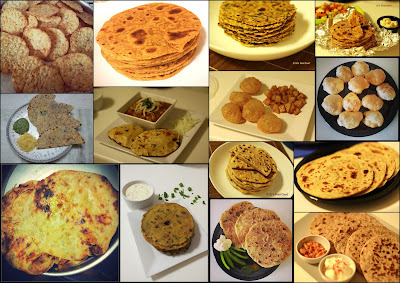 Being an integral part of Indian cuisine, these breads are prepared with different ingredients n different techniques in different regions of the country... Roti, Thepla, Paratha, Kulcha, Naan and many more categories... and each one of these with a number of sub-categories too!!! - Mix wheat flour, maida, salt, oil, 2 tsp garlic paste and yogurt in a big bowl. Knead a soft dough using lukewarm water. - Cover it with a damp cloth and keep aside for half hour. - In a tadka pan, take butter and 1 tsp garlic paste. Heat (or microwave) till butter melts. Keep it aside. - Knead the dough for a while one more time and divide into 6-8 equal balls. - Roll into thick chapatis and roast them on nonstick pan till you find brown spots on both the sides (quite like you do with normal roti). - Apply garlic butter generously over it. - You can alter the proportion of wheat flour and maida as per your choice. - Dried herbs can be added before kneading the dough to make them more aromatic! very innovative recipe. never tried this one but looks very tempting. Love roti! Yours sounds amazing!